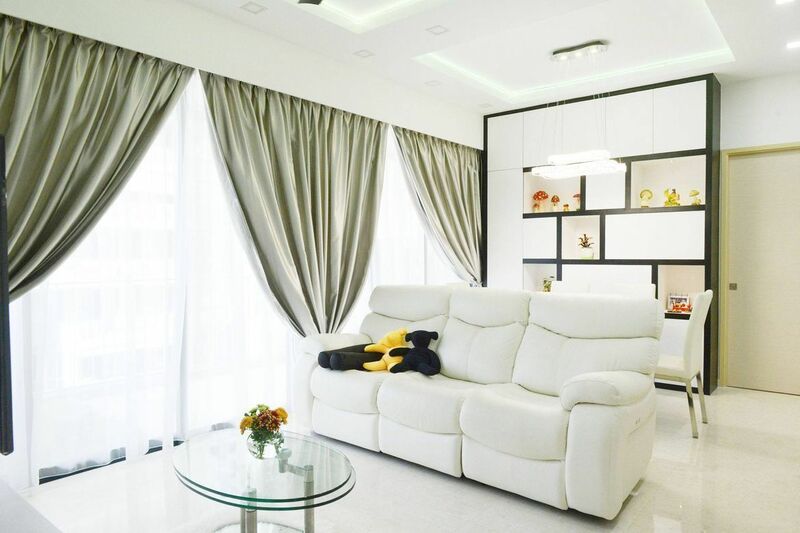 Married couple Patrick and Cindy used to live in a house replete with wooden furnishings, so they wanted their new home, a 1367-sq.-ft. 4-room private condominium unit in Sengkang Central, to look contemporary. They sought the help of interior designer Shawn Haw and Leon Chen of Rezt & Relax, to transform the unit into a modern and elegant space that would appeal to the couple and their two teenage boys. "The design follows the black and white colour scheme," says Shawn, referring to the white shelves and cabinets with black trimmings, white sofa and dining set, white walls, black ceiling fan, and black TV wall present in the home. The bedrooms also feature black and white furnishings that give the space an elegant and handsome look. But what the couple really like about their family home are shelves and cabinets that have kept clutter out of sight and the boys' lofts. "I knew that the bedrooms of my kids are small—plus they wanted to place the study table inside the rooms and wanted super single beds," says Cindy. "How to accommodate? The only way was to look up to make use of the high ceiling of the condo. I had been looking around for ideas and designs of lofts, and when we spoke to Rezt & Relax and saw the loft bed in their booth, I realised they’re experienced with building lofts." While the couple credits the designers for having done a superb job styling their unit, Shawn emphasises the couple's tremendous participation in the designing process. "We share the design," Shawn says. Indeed, when the interior designer and client work together beautifully, they produce the most satisfying result. "Every time someone steps in, he or she would compliment that this house is very nice and classy. Even during our housewarming, everyone was asking me 'How did you do this?' 'Where did you buy that?' They liked the layout and all the furnishings. I'm very happy," Cindy says with a smile. The clean and polished living room gets a lot of natural light, courtesy of the floor-to-ceiling glass sliding doors. The marble flooring—provided by the developer—complements the made-to-measure auto-reclining sofa and glass coffee table from Fullhouse Home Furnishings. The living area features a customised TV console and shelves adorned with souvenirs from the family's travels. "Renovation took a long time because there was a lot of carpentry in this home," says Cindy. The open floor layout in the condo covers the living room and dining area while the recessed ceiling with LED lights (that change to different colours!) creates the visual separation. "The master room exudes a simple but cosy design," says Shawn. The bed frame features a drop-down tray to store their items, and the lights above the headboard contribute to the room's relaxing ambience. The wall splattered with Nippon's textured paint Momento Metallic Gold provides a touch of glamour. Fronting the bed is a customised wardrobe that slides to reveal Cindy's bag collection. "I told Shawn to display my bags. It’s better to house them in a proper shelf, so I can just retrieve one easily and I don’t have to dump it in the wardrobe which is very untidy. I wanted something like in a boutique store," she explains. LED lights were also installed for a hint of pomp and glamour. Cindy admits: "We spent lots of time and effort having meeting after meeting and brainstorming about this loft. There's a beam, and we thought of all possible layouts around it. In the end, we decided to hack off the wardrobe (provided by the developer) which was quite painful because it’s new. Hacking it would cost us more." The result remains splendid: a loft-style bedroom that accommodates a study, wardrobe, and sleeping area. This loft-style space, made for the other son, features customised shelving, study, and a staircase that leads to the sleeping area. The floor used for the boys' bedrooms is Evorich's high-end resilient vinyl flooring. "They’re teenager boys, they’ll spill everything," Cindy says with a laugh. "So we decided to use vinyl flooring before building the loft." In fact, the couple changed all the four bedrooms' flooring from the original timbre laminate to the waterproof, heat-resistant, and scratch-proof vinyl flooring. "We got the dining table from Fullhouse Home Furnishings. The dining table can open up, from four to six seater, and I like the unique leg. When we checked with the manager, we decided to get everything from his store. This dining table caught my eye, and so we just looked for other furniture to match it," Cindy says. By the dining set is another customised shelving that holds souvenirs from the family's travels. "A lot of stuff are from Europe, America, Africa, and Asian countries. We collect unique items," says Patrick. Shawn created an inspiring entryway for the couple by installing a standout shelf with grey mirror. The hallway then opens to the bar counter area, which was provided by the condo. The knickknacks on the shelf are souvenirs from their overseas trips, and the unique wall clock was sourced from Taobao. The study room is occupied by this customised shelving system that comes with pull-out trays, drawers, and a glass cabinet. This space is for the couple as Patrick and Cindy sometimes work from home. The boys prefer to have their study tables in their own rooms, but take their piano lessons inside the study. Opposite the couple's study table are the piano and an overhead cabinet. "I had them build me a cabinet just for my Hard Rock bears. I have over 100 of them bought from different countries," says Cindy. The couple decided to enhance the kitchen provided by the condo developer by providing additional shelving. Cindy also asked Shawn to remove the shelves under the bar counter—he proposed to replace them with grey mirrors to complement the unit's modern and glossy look. Shawn also concealed the trash chute via cabinetry. Patrick and Cindy also asked Shawn to hack away the toilet in the kitchen, so the washer and dryer were shifted into the this area. A tall cabinet was built next to the sink where the washer and dryer originally stood. "Cindy loves to bake and collect baking 'toys,' so we need extra storage space. Besides there are four toilets in this home, so we don't need so many," Patrick says. "Patrick and I engaged our feng shui master. He told us this corner needed to have water feature, where water could flow. So Patrick DIY-ed this garden—he cut the drainage cells and the artificial grass, and we put the plants and potted them. The elephant stools were lugged back from Thailand. The wooden tulips and glass-blown flowers are from Europe. The rhinoceros and the hippopotamus are from Africa," says Cindy. All in all, Patrick and Cindy are pleased with how Shawn and Leon took over the renovation and designed their new home. "In every renovation, mistakes are inevitable, but Shawn was responsive and reacted swiftly and got things done," Cindy says. Patrick agrees: "He's a reliable designer. Plus, we also liked Rezt & Relax's after-service. Overall, good design." Total space: 1,367 sq. ft.
1) Know what you want and stay firm with your preferred design idea. "Look around for ideas and designs from websites, showrooms, and magazines before searching for an interior designer. This will help you cut down the legwork and meeting so many IDs. In fact, we only contacted two ID companies. Rezt & Relax is one of the two. We didn't go around searching and asking for quotations like other homeowners as we already know what we want." 2) Communication is very important throughout the whole renovation. "Engage someone from a reputable company, one that you feel comfortable to work with and can be contactable when matters arise." 3) Get involved in the whole process from the designing to floor plan, to carpentry to electrical and plumbing. "Always keep a measuring tape with you when you meet IDs or go on-site to check on the renovation. Do not leave everything to the IDs as there might be mistakes during the process. By involving and checking on the renovation, you will be able to rectify the mistakes and wrong measurements immediately before the carpentry is being installed and before it is too late for any rectification." Rezt & Relax Interior is accredited by the CaseTrust-RCMA.